When you hear the phrase “recruitment marketing,” what do you think of? Maybe the first thing that comes to mind is crafting the perfect job description, or optimizing a budget to advertise your jobs across the web, or improving the candidate journey to ensure that each and every job seeker has a positive experience with your company. In truth, recruitment marketing is all of these things – and a whole lot more. Recruitment marketing refers to the various methods used to attract, engage, and nurture both active and passive job seekers into candidates. It embodies everything from your organization’s employer branding and job advertising, to your candidate engagement and conversion strategies. Now, at first glance, this may seem like a lot to juggle. But each piece plays a valuable role in creating an effective, well-rounded recruitment marketing strategy for your business. In this blog post, we’re breaking down every step of the recruitment marketing process to help you build a strategy that will attract, and convert, the quality candidates you’re looking for. Before you can plan your own recruitment marketing strategy, it’s vital to first understand the candidate journey through the recruitment funnel, and where your marketing efforts will come into play. → A recruitment marketing funnel is a model that represents the candidate’s journey, from their first interaction with your organization to ultimately becoming a new hire. 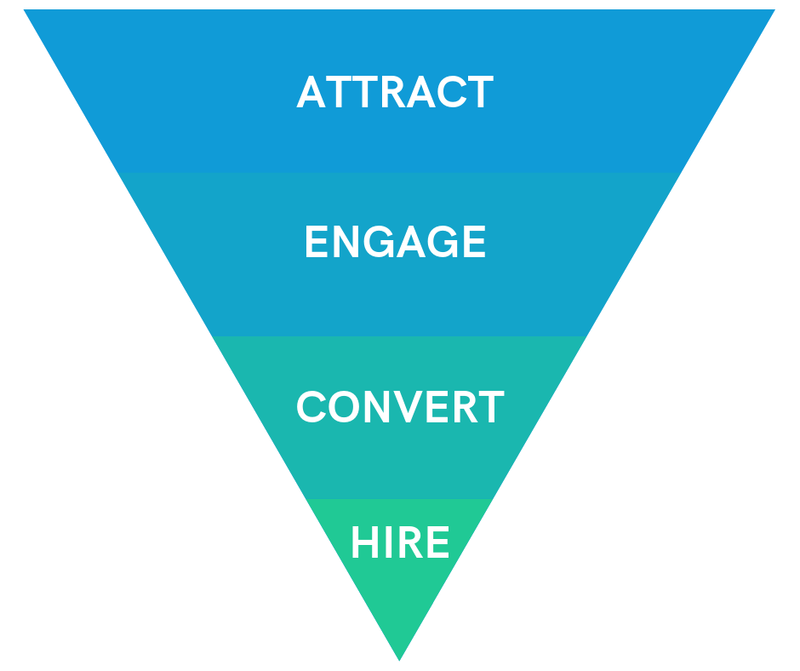 In the world of recruitment and talent acquisition, the funnel is made up of four main stages: Attract, Engage, Convert, and Hire. The candidate journey includes everything from the original interaction with your employment brand, further discovery of your organization, and any actions or conversations taken regarding employment at your company, potentially to the point of hire. The first two steps of the funnel, Attract and Engage, are where your recruitment marketing efforts will most come into play. It’s during these phases that job seekers are first introduced to your organization, and will make the ultimate decision of wanting to learn more about the company, the culture, and open job opportunities. During the Attract phase, talent acquisition teams should engage in tactics that build employment brand awareness and continually drive a pipeline of candidates toward the top of the recruiting funnel. In this phase, you can target active or passive (or both!) job seekers using different strategies. Once you have their attention, and job seekers have moved to the Engage phase, execute tactics that engage and encourage people to take interest in and research your company. Candidate nurturing strategies, like recruiting newsletters or paid display retargeting, can help keep your organization top of mind. Convert and Hire are, of course, vital components to the recruitment funnel – they are the final steps a candidate can take to joining your organization, and candidates cannot get to these final steps without first entering the funnel. In Convert, for example, new technologies are emerging to allow HR teams to text their candidates to keep lines of communication direct and instant, allowing them to move the hiring process along much quicker. But keep in mind: these two stages are handled by recruitment teams and no longer rely on recruitment marketing efforts. Now that you know the candidate’s journey, and how it will impact your recruitment marketing, you need to speak the language. Recruitment, like any other industry, is filled with it’s own unique lingo. Applicant Tracking System (ATS): An ATS is a critical tool for recruiters, staffing firms, and agencies that have high volumes of candidates. Many mid-sized and enterprise employers will need (and already have) an ATS to manage the day-to-day of their sourcing, screening, and recruiting processes. Ensuring that applicants are properly sourced and sorted is invaluable. Candidate Relationship Management (CRM): A CRM builds pipelines and helps solves the recruiting needs of tomorrow. However, you may not even be managing people who are candidates yet. You may only have a name and an email of a candidate in your CRM. As you track their click history, with a CRM, you can gradually build profiles to see where they fit in your talent pool. Since they are not yet candidates, you don’t have to worry about compliance or lengthy apply flows. CRM’s also do not require resumes. You can build the profile based on where a candidate wants to go, rather than on where they’ve been. Corporate careers site: Today’s corporate careers site serves as a multimedia information portal, an extension of job postings, a driver of candidate engagement on social media, and more. They enable organizations to showcase their company culture and values, organization accomplishments, and – of course – open job opportunities. Job boards: A job board is an online website for an employer to post their open roles, and is often a sought-out destination for job seekers that are looking for a job. LinkedIn, Indeed, and Monster are three of the most well-known job boards in the US. Aggregators: Aggregators are an online website that collects related items, and in this case, job postings from throughout the web, and displays them via direct links. Google for Jobs is an example of an aggregator. Talent pools/communities: Talent pools, or communities, are an online compilation of potential candidates sourced from a platform, for employer or recruitment agency utilization at a later date. Job seeker: There are two types of job seekers – active, and passive. Active job seekers are just that: actively looking for new employment opportunities, sending out applications, and accepting interviews. Passive job seekers, on the other hand, can be people who are currently employed and not actively looking to make a career change, or people who are thinking about making a change and skimming job boards, but not actually submitting job applications. Candidate: Contrary to popular belief, “job seeker” and “candidate” are not interchangeable. Rather, they are linearly connected; a job seeker becomes a candidate once they have submitted their job application on one of your open roles. It’s the job of recruitment marketing professionals to turn those job seekers into candidates. But like job seekers, there are also various types of candidates (like qualified and unqualified candidates) that your recruitment organization will have to bucket based on the predefined qualifications for each individual job role. Each of the terms laid out here plays an integral role in your recruitment marketing strategy. From the tools and technology you can use to help streamline processes, to the networks you can utilize to reach and attract job seekers, to what makes someone a job seeker versus a candidate. Effective recruitment marketing requires a multi-faceted approach – putting all of your eggs into one basket, like employer branding, will be much less effective than spreading out your resources to other means for attracting and engaging job seekers. In truth, each piece of the recruitment marketing puzzle is connected, and work together to form a holistic recruitment framework. With the power of the internet at their fingertips, job seekers can learn everything about your brand, your values, and your culture without ever actually entering your recruitment funnel. This is why staying on top of your employer branding via your corporate careers site is an important first step in recruitment marketing. 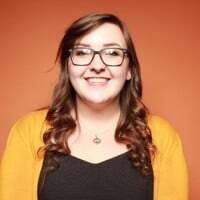 Think about it like this: what are the odds you would apply to a role, even if you’re a perfect fit, if you can’t tell what it’s like to work for an organization from their online presence? Probably not very high. The same can be said of your own job seekers. Your brand – who you are, what you do, and what you say – holds more weight than ever before. Candidates will research you, so make it as easy and helpful as possible. Showcase your true company culture on your career site: tell people what it’s really like to work for you, promote the positive aspects of how you treat your employees, and don’t post formulaic job descriptions or mission statements. By investing in your employer branding, you’ll bring your organization one step closer to being a brand that attracts active job seekers, and become a place that potential candidates are eager to apply to. P.S. While the majority of job seeker research will take place on your website, don’t forget about your company Linkedin, Facebook, and even Instagram pages. Play to a social platform’s strengths, and showcase your organization’s values and culture in your online presence. Remember: your candidates are already researching. Be prepared. Your recruitment advertising strategy impacts the candidate volume you can drive in your recruitment funnel. Sometimes, organic traffic to your careers site just isn’t enough to drive the volume you need. Other times, you’re recruiting for hard-to-fill roles that are costing your organization time, money, and resources by remaining open. At the same time, you want to ensure that you can maximize your recruitment marketing budget, while also driving the results (i.e., candidates) that your organization needs. Executing strategic job advertising can help close the gap. 1. Before a job is posted, collaborate with hiring managers to define a successful job description for each particular role. Our research has shown that there’s a sweet spot for both job titles and job descriptions. Keep titles short at 1-3 words, and descriptions between 300-800 to maximize your apply rate. 2. Create content that is conversational, balancing essential company information with a sense of purpose for job seekers. Going back to investing in your employer brand, companies with higher Glassdoor ratings typically see ~50% higher click-to-apply rates. Leverage employee reviews, and build a positive brand presence for job seekers to relate to. 3. Provide candidates a continuously smooth experience by selecting a dedicated recruitment platform. How many times have you given up on a job application that asked you to upload your resume, and then manually fill-in all of your personal information and work history anyway? No candidate wants to spend more than a few minutes submitting an application, so don’t make them. Use an ATS that keeps it simple and only asks the necessary questions. 4. Utilize a flexible, programmatic advertising strategy that ensures the right job seekers click on the right ads. One of the best ways to manage your strategy is through performance job advertising, where you only pay for the results that matter to you and your organization. Utilizing pay-for-performance ensures that you never over-spend on jobs that don’t need any more applicants, and that your budget stays flexible with your hiring needs and goals. Download our Recruitment Marketing Resource Hub kits to become a recruitment marketing champion! So, someone lands on your company website or one of your job ads, completes the job application…but aren’t a great fit for the role they selected. Or maybe they are a great fit for the role, but the posting was old and the role has already been filled. Or, in a perfect world, they match the job criteria and you want to get them started in the hiring process. What do you do with all of those candidates? This is where your CRM comes into play. First, candidates who enter into your CRM become a part of your talent pool. From there, you can take the information they’ve provided to you, and nurture candidates who look like a particularly good fit for your organization. Automated email sequences allow you to continue to engage these candidates, build a rapport, and guide them further down the recruitment funnel. Second, you can also use your CRM to keep your talent pool updated on your organization’s current recruitment needs. Encourage members to sign up for your newsletter, share new job openings, and any positive company news. Candidate engagement is a vital and integral step of an effective recruitment marketing strategy. After all, your efforts to create and maintain your employer brand and optimize your job ads will be fruitless if you don’t cultivate a positive sentiment with candidates coming into your pipeline. 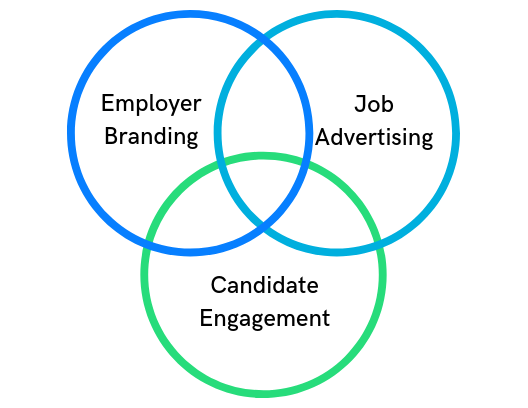 Candidate engagement also directly affects your employer brand. Word travels fast, and if someone has a negative experience in the hiring process with your company, it’s likely that other prospective candidates will hear about it. Now, we know – there’s a lot to stay on top of when it comes to recruitment marketing. For many organizations, the answer is investing in a recruitment marketing platform. Think of a recruitment marketing platform like your ATS, CRM, and job posting software all in one interface. There are a variety of benefits to utilizing an RPM, from hosting your corporate careers site and maintaining your employer brand, to keeping track of new applicants and executing candidate nurturing strategies. Not all software and strategies are created equal, however, and different organizations will have different approaches to managing their recruitment marketing strategy. Before deciding to invest in a recruitment marketing platform, evaluate your current recruitment technology stack, your hiring goals, and the overall needs of your organization. Recruitment marketing is an invaluable piece of the talent acquisition landscape. Without it, how would prospective new candidates ever learn about your company, or enter your recruitment funnel? Having a recruitment marketing strategy in place is important for organizations of all sizes and stages. It allows you to take a step back and think about the bigger picture of your organization, its goals, and how finding the right candidates will help those goals become achievable. By creating an effective strategy, you create a scalable framework for your organization to use as you grow that helps you keep goals and key metrics – like budget and candidate quality – at the forefront of your recruitment planning processes. With a solid process in place, you’ll keep your candidate pipeline full, and continue to attract quality talent to your organization. Discover everything you need to kick off an effective recruitment marketing strategy in our Recruitment Marketing Resource Hub.